This is my New Computer. You can see my Old one Here. I built This one after my old one died (motherboard problems), and instead of buying a new motherboard for my PIII I decided to just upgrade to a P4 Motherboard. 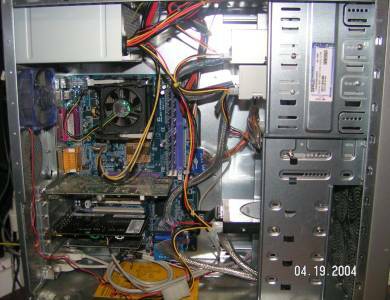 For which I needed a new Power Supply and Ram, So I decided to just go all out, the only thing I re-used was the Video Card, DVD-drive and Hard Drive. I Bought my case at A local Computer shop here, I am Still trying to stay away from beige, (ugh!) 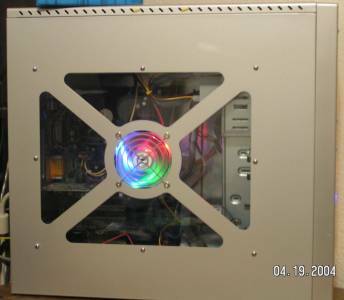 and this case has some really nice features, such as a slide off panel on both sides, (With a Window) so you dont need screws to get into the case, but with the option of putting Screw's in if you don't want easy entry to the case for some reason. A Window in the side so you can see all the stuff inside, with a fan in the middle that blows out. 4 internal hard drive size bays (who can live with just one hard drive?). And no sharp edges anywhere. 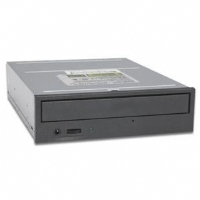 A Aopen DUW1608/12X DVD ReWriter. I paid $65 for it including shipping. I've got a Saitek Eclipse keyboard. I love it because The keys are backlit so I can see them even in the dark. My motherboard is an Asus P5N-EM HDMI. My processor is an Intel Pentium 4 2.8GHz 800MHz FSB with hyperthreading. UPS-uninterruptible Power Supply. A must if you ever experience short power outages. I finally got sick of these frigging half second power outages ruining my gaming, so I went out and got an APC Back-UPS Office 280. Its rated at (supposedly) 11 minutes of power, but I really only got it for short outages. The pic really doesn't do it justice. This thing is BIG compared to a normal surge protector, its 2.7 inches (6.9 cm) high, 17 inches (43.2 cm) long, 7 inches (17.8 cm) wide, and weighs 8 lbs (3.6 kg)!! Got my floppy DRIVE from my local pc upgrade store for $20.00 US, its an nec. 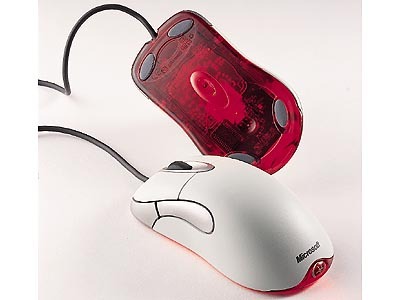 I had one I bought from CompUSA for $30, but I took that one back because it didn't come with any mounting screws.